This article describes two spectral methods for solving problems in interfacial fluid mechanics. These are illustrated here for the Rayleigh--Taylor instability, in which a layer of heavy fluid lies above a light fluid. Disturbances to the interface between them are unstable, and grow with time. 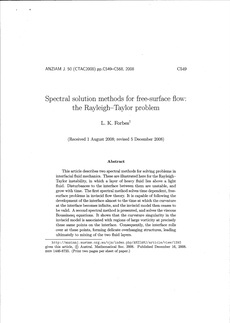 The first spectral method solves time dependent, free-surface problems in inviscid flow theory. It is capable of following the development of the interface almost to the time at which the curvature at the interface becomes infinite, and the inviscid model then ceases to be valid. A second spectral method is presented, and solves the viscous Boussinesq equations. It shows that the curvature singularity in the inviscid model is associated with regions of large vorticity at precisely these same points on the interface. Consequently, the interface rolls over at these points, forming delicate overhanging structures, leading ultimately to mixing of the two fluid layers.